I obviously meet lots of dogs and cats every day and I connect and adore all my patients. However, I definitely sometimes develop an instant connection with a pet for whatever reason and feel quite bonded to it. It is not uncommon to feel like your own pet chose you and you could not resist! Check out Shorty. How cute is that face? Can you honestly tell me you would be able to resist that? Shorty was one special girl. She was the most interesting cross. 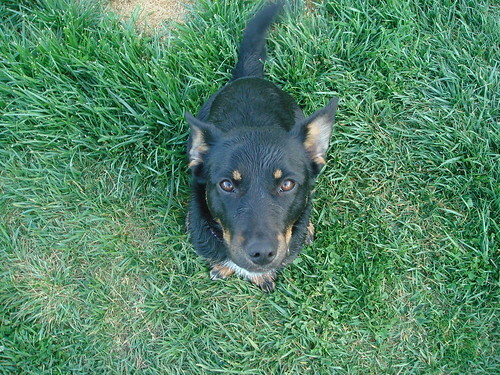 We highly suspect she was a cross between a kelpie & dachshund. Looked like a kelpie but with very short stubby legs and a long body like a dachshund! Check out the pictures below of her after I desexed her and removed her very abnormal dewclaws (that’s why her backlegs are bandaged up). We usually will not recommend removing the dewclaws unless the dog is injuring them repeatedly. 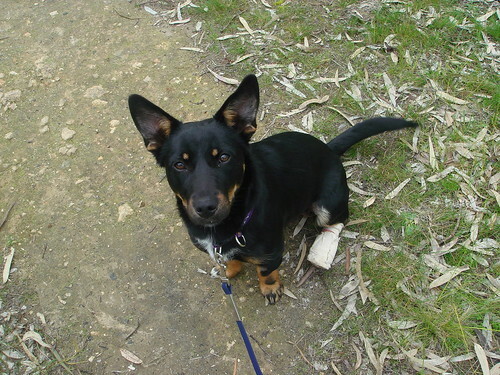 She, however, had a double set of dewclaws on each of her backlegs and so they had to be removed. I can’t remember the fine details of how ‘Shorty’ended up in my possession but I know she was a stray and I took her on to rehome her. I had rehomed heaps of animals and if I found the perfect owner for them, it was easy for me to hand them over to their new owners. However, every now and then, you meet a special dog or cat and feel your bond is too powerful and rehoming them suddenly feels like you are giving them up or even abandoning them. 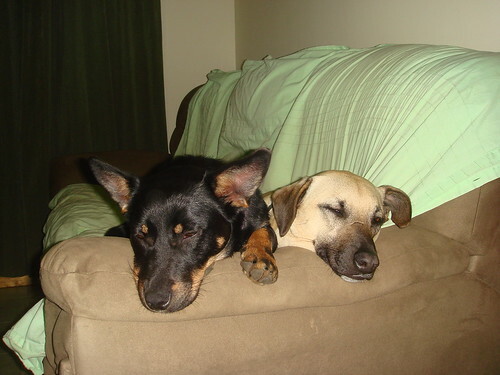 I have two dogs and they are quite tolerant if not welcoming to stray dogs I bring home. Usually the stray dog is either ignored by both my dogs or plays with one or both of them but mostly bonds to one of my dogs. In Shorty’s case, she was the perfect fit. She loved both my dogs and would spend equal time with each of them. My dogs had really connected to her and treated her like she was there to stay with us! The pictures speak for themselves below. Shorty all smoochy with my dog Punchkin. Unfortunately with my work load, small backyard and commitments, it was not feasible to keep her. It was unfair on her because she had so much to offer. Not only was she so affectionate, loving, well socialized but also very intelligent and easy to train. I was not going to give her up unless the perfect owner came along and he did. Kim, my friend, organised it all for me and had to peel her out of my arms to drive her from Naracoorte in South Australia to Adelaide (3.5-4 hour drive) to her new owner. He actually created a blog about Shorty but unfortunately we have lost contact over time. This is the last cuddle I gave my beautiful Shorty before she joined her new family. I could never give them up! That is why I have resisted fostering. The two I have are more than enough. Hey Jodi. Having to be directly involved in dealing with so many rehomes, I had no choice :-). I would have countless animals otherwise. It aint easy to let go of them, that’s for sure! 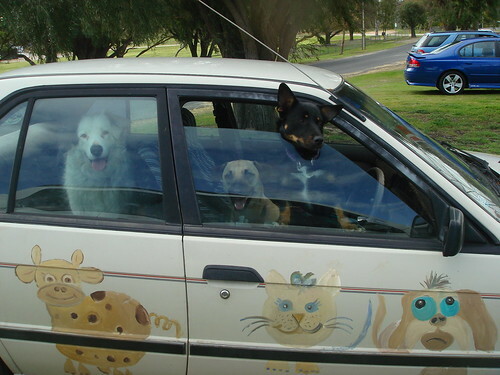 I love the paintings on the car! Very smart idea, plus it’s very original and cute. Hey Ashley. My mom was the artist and surprised me one day. It gave my car so much personality and life! Glad you liked it. Fortunately I have never had to give up dog. Would tear my heart. But with all the rescues you do finding a good home is wonderfu. Hey Gretchen. Finding them a beautiful new home is what eases the sorrow of having to give them up. :-). Shorty was definitely a hard one to give up. I can easily empathize–I have a third dog that came to us as a stray last summer. We meant to “find a good home for her” once we got her cleaned up and trained, but as my husband says “she’s already found a good home with us”…So, I guess that we are a 3 dog household now. When you add that to three cats, two horses, and 3000 cattle our family is very “animal oriented”! Thank you for stopping by my blog and posting a comment. I hope that you will continue to follow it. I think in my case, my husband was the one that stuck to his guns and said we simply can’t have a third dog. He, however, almost gave in for another dog we kept for a while. So we are bound to get our third dog. 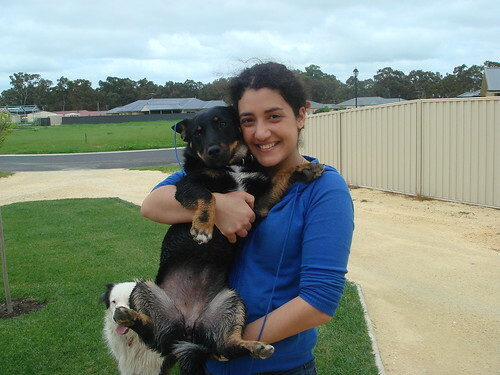 Shorty is gorgeous and I would have fallen in love with her too; our son had a kelpie cross years ago and Shorty reminded me of her, bringing back happy memories. As I was reading through your post, I shed a tear when you had to part with Shorty, it must have been tearing your heart out. But at least you know she has gone to a good home. Shame you lost contact with her new owner. Thanks for sharing the story of your son’s dog. It was really touching. It is a real shame that I lost contact with her owner. I really enjoy getting updates about my rehomed pets and even sometimes reuniting with them.